How does your alma mater stack up against others in your conference when it comes to hiring and retaining women coaches? Each year, the University of Minnesota’s Tucker Center assigns grades to college athletic departments based on the percentage of women head coaches of women’s teams. In 2017-18, Cincinnati and UCF rose to the top of schools in seven select NCAA DI conferences. 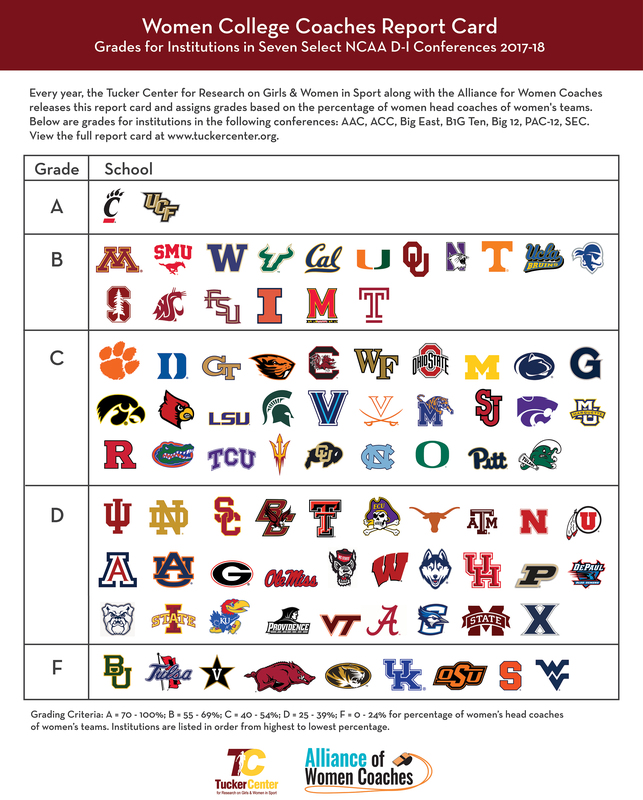 Nine schools, however, received an “F” for having a truly dismal number of female head women’s coaches. This summer, the Tucker Center went one (big) step further, and released a report funded by the NCAA to explore the best practices for recruiting, hiring, and retaining women collegiate coaches. Extensive interviews were conducted with 21 Athletic Directors (AD’s) from NCAA DI, DII, and DIII schools that received a grade of “A” or “B”. Women coaches matter. First, girls and young women deserve to see themselves in their coaches; being able to do so elevates their self-perceptions and helps them see coaching as a viable career option. Second, “diversity in the workforce is a business imperative, and athletic departments should not be the exception” (1). Our priority is serving our student-athletes, and having a diverse staff will help us to do this better. The percentage of women’s teams that are coached by women has dropped precipitously since the 1970’s… Why? “It is simply not possible that as each new generation of females comes increasingly involved in and shaped by their sport experiences, they simultaneously become less qualified to enter the coaching profession” (1). AD’s spoke candidly and anonymously on the (very real) barriers to hiring and retaining female coaches. Many of the AD’s felt a strong personal conviction that “women should be coached by women”, but felt unable to express this desire during the hiring process. One AD points out “the paradox of wanting to hire women to coach women, but not being able to explicitly state it… as AD’s do not want to make themselves or their institutions vulnerable to litigation” (7). This AD goes on to explain that this barrier is unique to women, because the ingrained expectation that men’s teams will be coached by men is so strong that gender won’t even be a part of the conversation. The challenge, then, is to “create a consistent and strong culture of valuing women without crossing the legal line” (7). The report sets out to help your athletic department do just that. While this report is designed as a resource for AD’s and Senior Women Administrators (SWA’s), there are nuggets of wisdom that can guide any coach in their pursuit of an equitable work environment. Plus, this is an amazing resource to have in your pocket if you will one day be interested in pursuing a career athletic administration. What can young, female coaches take away from this research? “If athletic administrators create a workplace climate where essential needs of care, competence, and choice of women coaches are met, the department will likely attract women” (5). A good workplace will demonstrate that they care about you, trust you, and give you autonomy. Learn more on page 5! Do not be embarrassed to tout the benefits of women coaching women. Be confident that you have unique gifts that a man in the same role would not. See Appendix A for strategies to approach athletes who are not yet convinced. Look within your program for highly successful, strong women. Reach out to her. Support her. Learn from her. Page 12 expands. Find a space where you are untested, and have the courage to ask for a chance. One day, when you are a head coach, these skills will be invaluable. This is especially true for women of color (see pages 12-14). SIX: Bomb an interview? Don’t sweat… learn! One AD promises that “the experience of explaining and knowing what questions are going to come is helpful for future interviews” (19). Keep moving forward. “He is We” might as well have been singing about creating a career-development plan. Know where you’re headed. Share it with your AD or SWA. Find and join relevant organizations. Be a student of the sport. Be aware of whether your AD’s performance expectations for your program are possible considering the resources you are given. If they are not, do not immediately blame your own coaching. Work with your mentors to change your strategy or expectations. If this does not work, do not be afraid to move on to a program that can offer better support (like is described on page 15). Don’t forget — If you demonstrate excellence at your craft, you WILL be highly sought after. See Appendix C for the Women Coaches’ Playbook for Being Hired and Retained (attached below).